Expert Textperts: The Bible and PoMoTextuality - I can't help it, I was born this way. The Bible and PoMoTextuality - I can't help it, I was born this way. Which do YOU see and what does that say about you, my friend? 1. Ultra-conservative evangelical claims about biblical inerrancy and the infallibility of the word of God are silly. As Ehrman points out, if we have no access to the original texts and the texts we have indicate thousands of changes, then the inerrancy of the original is completely irrelevant. 2. LDS who believe in wholesale textual changes at the hand of the Catholic church or other post-Nicene institutions are mistaken. We have manuscripts going back to the second and third centuries AD with enough broad agreement to know the basic outlines of the texts, notwithstanding the variants. If the scriptures were radically altered, it would have been in the first century AD, from which we have no surviving manuscripts. I personally doubt that nefarious apostates removed large chunks from the gospel texts in those early years, but whatever the case, the changes made after the Christian church became institutionalized were smaller, focusing on interpretations and translations of individual words and small passages rather than the kinds of massive rewrites we’ve sometimes been led to believe occurred. Not that these small changes are insignificant - Ehrman demonstrates that many are - but they don’t necessarily move the text any closer to LDS doctrine. The point is that Luke changed the tradition he inherited. Readers completely misinterpret Luke if they fail to realize this - as happens, for example, when they assume that Mark and Luke are in fact saying the same thing about Jesus. If they are not saying the same thing, it is not legitimate to assume they are - for example, by taking what Mark says, and taking what Luke says, then taking what Matthew and John say and melding them all together, so that Jesus says and does all the things that each of the Gospel writers indicates. Anyone who interprets the Gospels this way is not letting each author have his own say; anyone who does this is not reading what the author wrote in order to understand his message; anyone who does this is not reading the Gospels themselves - he or she is making up a new Gospel that is not like any of the ones that have come down to us. Anyone who’s read Talmage’s Jesus the Christ or any of a million other religious books (LDS and otherwise) critically should recognize that tendency. By attempting to harmonize the gospels or any other scripture, we end up reading things into the text that it can’t support - we see what we think should be there rather than what is actually there. The reality, I came to see, is that meaning is not inherent and texts do not speak for themselves... Texts are interpreted, and they are interpreted (just as they are written) by living, breathing human beings, who can make sense of the texts only by explaining them in light of their other knowledge, explicating their meaning, putting the words of the texts “in other words.” Once readers put a text in other words, however, they have changed the words. This is not optional when reading... to read a text is, necessarily, to change a text. This is a rabbit hole that very smart people have delved into, often with words like “praxis” and “intertextuality” and “hegemonic”. My point is that I can never see with Olympian detachment the scriptures as a thing in their own right with their One True Meaning. If such a thing is possible and all truth can be circumscribed into one great whole, then that’s nice but it sure can’t in this life. I can’t free myself from the text because I can only understand it in terms of other texts*** - in words and ideas I’ve learned, in explicit and implicit belief systems I’ve accepted, rejected, and internalized. Moving beyond Ehrman, the ideas I’ve mentioned force us to ask some tricky questions. If there's no distinction between our perceptions and our reality, how can we come to understand and rely on a belief system that claims absolute, eternal truths? This is the kind of thing Brett dealt with earlier, and it’s worth a post or two or ten in its own right. I’ll skip trying to answer it now because this post is long enough, but comments are appreciated! *Ehrman actually argues that the one instance in Luke where Jesus becomes emotional, in Gethsemene where he was “in agony” and sweat “as it were great drops of blood”, is actually a scribal addition meant to support orthodox claims of Jesus’ humanity against gnostics who denied it. That does no favors to the LDS interpretation of the suffering in the garden, but the literary evidence is compelling. **This isn’t to suggest that we’re being strung along by invisible forces around us, unable to alter anything about ourselves. I believe that agency allows and compels us to make decisions that can alter our life and outlook. But every decision is shaped by outside factors - a teenager who grows up with alcoholic parents and chooses to drink only in moderation may be outwardly similar to the Mormon teenager who drinks occasionally to rebel against his parents, but both are reacting to forces beyond their control, which inevitably shape how they view their own actions, however alike they seem to be. *** I’m using the word “text” here in a very broad sense to mean, basically, “anything that can be interpreted” rather than “a bunch of words on paper”. So the Bible is a text, raising my hand in classroom is a text, capitalism is a text, I am a text, you’re a text, pretty much everything is a text. Until you get to the turtles, then it’s turtles all the way down. We are so predisposed to our personal beliefs that often we fail to see there are other points of view, and I think both the Cracked article and your post illustrate that well (albeit in different ways). My roommate has a big book that puts all four gospels into four columns, each arranged so the same stories, parables, etc. are right next to each other. I always thought it was interesting. The purpose of this book is, of course, to show how the gospels agree with each other, but all it does for me is highlight further just how different they are. My favorite part of the book, though, is how they added the Joseph Smith translation as bolded words, except when he replaced an already present phrase, in which case they show the original wording with a strike through it followed by the bolded changes. This to me is very interesting from a pomo viewpoint. The book is designed to show that each gospel tells the same story from different perspectives, yet it also shows that some parts are either word for word the same (suggesting less that they "tell the same story" and more that they "ripped off the same source") or are entirely different; then, it seems to suggest that, in the end, the most important gospel writer was the one who came 1800 years later, and whose written work in the Bible is used as a study guide at most in the church. Very interesting. 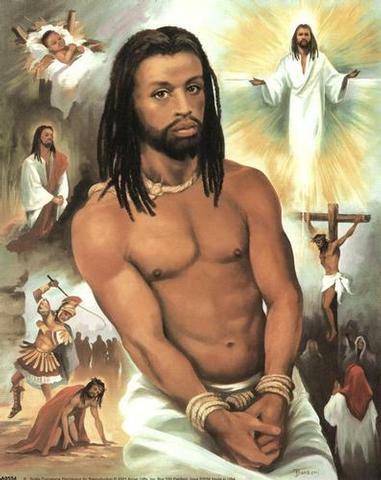 Also--this blog needs more black Jesus. So Allan learned a fun Pomo word he didn't know about at the conference he attended in Chicago: palimpsest. So you all might already know this, but a palimpsest refers to a cool practice and effect related to medieval scriptures. Parchment wasn't always a commodity that people had in abundance, so sometimes writers would take paper that was written on and scraped off the ink so they could write something new. However, with the passage of years, the ink from the original work, which had died the paper, started to return. It seeped in and through the words that were transcribed on top of them. There's a similar thing that happens in graffiti sometimes. So yeah, a palimpsest is just like a beautiful metaphor that has the added bonus of sometimes being quite literal depending on the topic. A text carries within itself its own negation. In order for an interpretation to make sense, it must work upon an order, logic, or ideology which has value in its devaluation and negation of other ideas or ways of knowing. But to negate is to always-already interpellate a voice of alterity that it silences. Because alterity and silence are not eliminated, while scraped away might still stain the parchment, always threatening to seep back through the words written on top of them. Give the parchment 2000 years and countless denominations, political situations, and translations: you get a pretty awesome work of graffiti that is by its own existence somehow a form of vandalism. How's that for black Jesus.